We have been invited to a swap with the Essex County MQG (Ontario). We have settled on the Mini Scissors Case with Needle Minder. Sign up was at the February meeting. 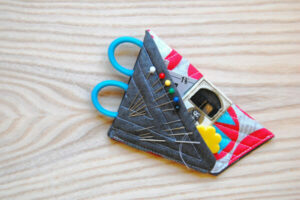 Your Mini Scissor Case with Needle Minder is due at the April meeting. Update: One of our members has reported that there are some cutting errors on the size of some of the pieces. All cut pieces should read .5. 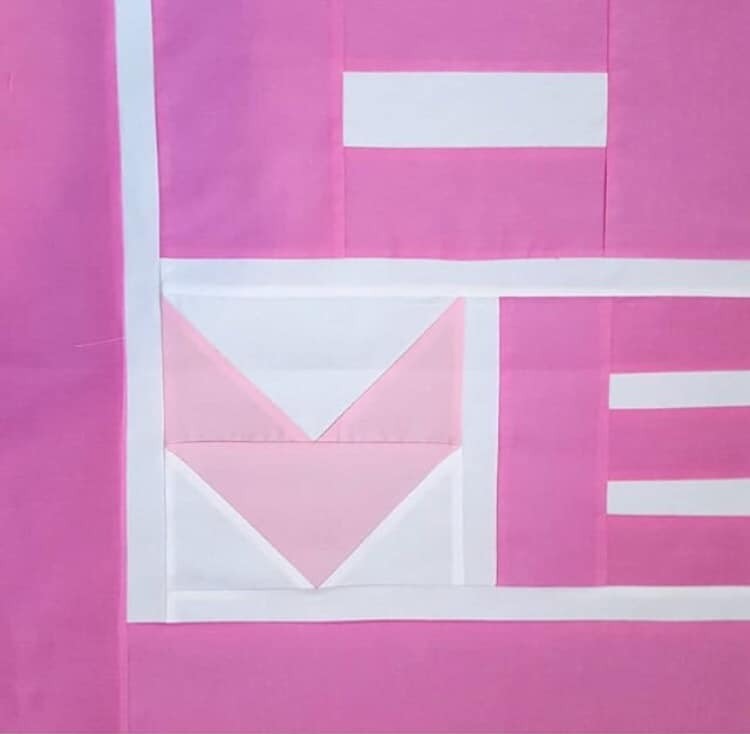 There are two strips that have a typo : white 1.5 x 5 and pink 1 2.5 x 5, make both 5.5 in length or your E will be too short. 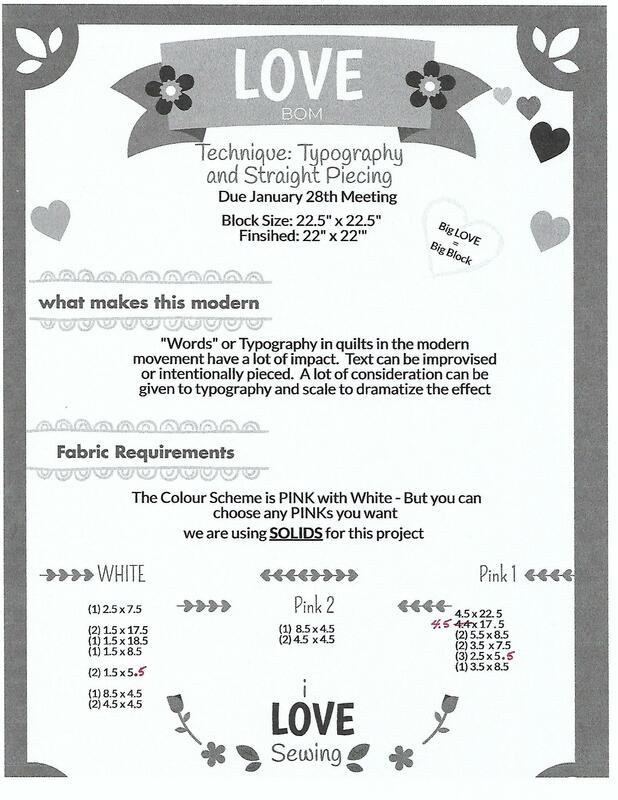 Your mission if you choose to participate is to create one or two or more out of white and pink for the Feb meeting!! Yes. A whole month! Lots of time to spread the 💕 💗 💕. 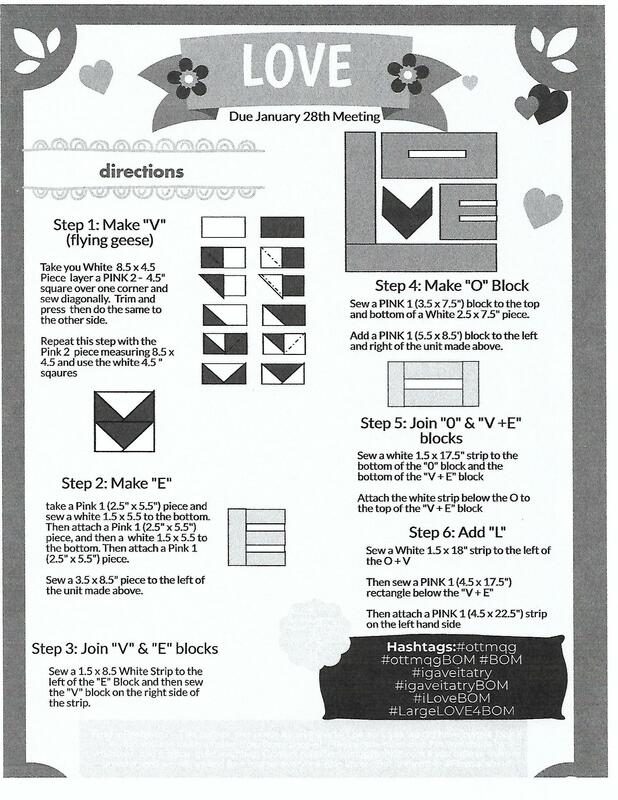 Bring your finished block(s) to the Feb meeting and you may end up with a whole lotta love!!!! UPDATE: Some of our members have reported that they are unable to access the block instructions using the link provided. 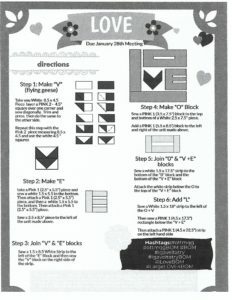 I have uploaded a scan of the pages here if you prefer to print/view the instructions from these images. If you click on the image, it should open up bigger on your screen. Double check on quarter inch seams. Test a 1.5″ strip between two other pieces. A true quarter inch seam in each side will produce a one inch strip fully sewn. Adjust accordingly. Use 50 wt or finer cotton thread. Use Best Press or similar product before cutting. Press seams open for a flatter (and therefore more accurate) finished block. Press as you go! Every. Single. Seam. For the triangle blocks, cut the two squares at 3.25″ rather than 3″. This gives you more trimming room if your seam allowance is off. For the blocks with rectangles, cut a strip of each fabric 11″ x 1.75″ and sew together on the long side. Trim each side of the seam to 1.25″ resulting in a strip 2.5″ wide. Now crosscut four blocks at 2.5″. Cut the rectangle pieces wide and as a strip, and then trim to size. Cut two strips, 1-3/4 x 5-1/4, sew together, then trim so the seam is centered and each side is 1-1/4″ and cut blocks at 2-1/2″. Any place that you need a 1.5” rectangle to sew to the outside of a block, cut it 1-5/8” or 1-3/4” and then trim to size after it’s sewn and pressed. Also, to reduce bulk at the nose of the geese, press the seams open. We want to challenge all of you to take part in the CQA 50 blocks in 50 weeks challenge! Remember to make it modern! This is a great opportunity for those of you just starting with modern palettes. How? Choose a bright palette of solids or a neutral palette of grey/black/white, or maybe a favourite modern designer — the blenders from Allison Glass, Libs Elliot, Carolyn Friedlander, Tula Pink, Elizabeth Hartman . Go scrappy; but remember to keep to clean, modern styles. Stay away from beiges, taupes, country, or historic colourways, batiks, etc. The first part of the challenge is to pull fabric from your stash (or shop the Boxing Week sales!) and post a photo of your selections before our next meeting on January 10, 2019. There may be the occasional surprise for those taking part, so hop on board! This will be fun! Editor’s note: the following was taken from the CQA website. You can arrange it anyway you want, but if looking for a finished size with no sashing or borders, the quilt would be 36” x 48”. 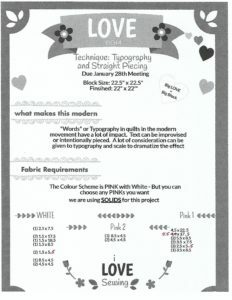 For a quilt with a 2” sashing throughout and 2” border the size would be 46” x 62”. The sashing and border fabric requiring 2 yards in total.